Wines from the Jura are one of the hottest ticket items in wine bars across the globe at present. Why has this obscure wine producing region known mainly for the aged, yellow, savoury Vin Jaune become so popular? Perhaps it was the flavoursome Savagnin white wines or the delicious Chardonnays that brought it to the forefront, or perhaps it is a reaction to the heavy reds of Australia and the United States with drinkers preferring the lighter, more expressive styles of the Ploussard, Trousseau and Pinot Noir wines from here. Regardless, we are delighted to be working with Philippe Bornard, one of the region’s most exciting natural winemakers. He produces a wide range of wine styles and we order most of them to let you work out which ones you prefer. Philippe lives in the quaint village of Pupillin which is quite close to Arbois near the Swiss border. He inherited the vineyard from his father and decided to make wine himself rather than sell his grapes to others. He makes his wine under his house which overlooks the village. The wines cover two appellations. 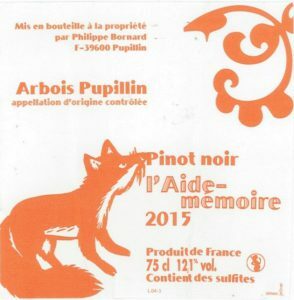 The first is the broader Cotes du Jura and then most of the wines are from the tiny Arbois Pupillin which only applies to grapes grown in the commune of Pupillin. You will notice that in this appellation it is permitted to name the grape variety on the label – which is unusual for France. 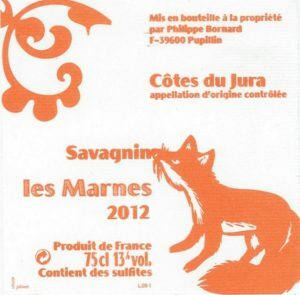 In the Jura, red wines are often released years before the white wines because the winemakers want the whites to develop the oxidative characteristics that make them so food friendly. After working with Philippe for almost ten years he has decided to retire from front line winemaking. His talented son Tony is taking over the entire operation, however his father still provides advice where requested. The ultimate aim is to combine the two domaines of Philippe Bornard and Tony Bornard. We will keep them separate for the time being. wine’ in the Jura. It is matured in old 228 litre casks which are not topped up. The maturation must continue for a minimum of 6 years and 3 months. This means that a film of yeast develops on the surface of the wine (known as a voile) thus protecting it from the oxygen in the gap in the barrel. However some oxidation occurs giving the wine some sherry-like characteristics even though it is never fortified like sherry. festival in Arbois to celebrate the bottling of the current Vin Jaune. what can be achieved with this delicate grape variety. “A delicious vintage for this lovely Trousseau from Philippe Bornard, the wine has an absolutely gorgeous rose petal-y texture, especially after some time in a decanter. The wine definitely shows the richness of the vintage and is soft and open with warm, generous red fruits, sweet cherries, cranberries, and herbs. If you are smitten by big, robust, Barossa shiraz wines then please don’t buy this one. The Point Barre is made from the Poulsard (aka Ploussard) grape and is a light, delicate almost translucent red wine that gives off aromas of red currants, citrus and saddle leather with a touch of cinnamon. It is not high in alcohol (at a pleasant 12%) and it does not have aggressive tannins. There is instead a purity and silkiness to this wine that makes it quite ethereal. It matches with just about any food you care to think of. 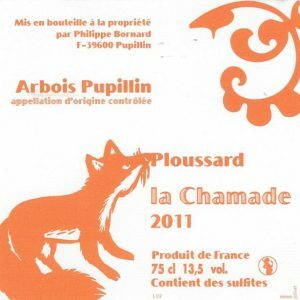 This Ploussard is exactly the style of wine we have come to prefer. Darker in colour than other wines made from this grape, long on flavour and with a soft and silky mouth feel. There is an earthiness about this wine but the finish is reminiscent of cherries that have been lightly spiced. The grapes are macerated for three weeks in fibreglass tanks and the wine is then aged in one of the large wooden foudres that line his winery for a year before the wine is bottled. “La Chamade” literally means ‘wildly’ but in the context of the pounding of the heart when drinking a good wine. Lovers of Burgundian-style Pinot Noir wines might find this one a bit different! There is an earthiness to this funky, ‘alive’ wine that we find quite appealing. There are notes of mushroom (in a nice way) and cherry and a mineral finish that is quite long. As with many of Philippe’s wines, this one has that lovely savoury, umami quality that makes you want to take another sip. It is interesting to note that more and more lovers of Pinot Noir are starting to compare their favourite red wines from Burgundy with those from their eastern neighbours in Alsace and the Jura. There are some very special wines that rival their better known cousins and this is but one. There is a lot happening in the glass and yet the alcohol level is only 12.1%. Philippe’s wines. He found a few cases of wines hidden away including a couple of the fabulous Pinot Noir called Le Garde Corps. So we don’t have much but it is drinking very nicely. The Blanc de la Rouge is an intense, concentrated, very dry Chardonnay that shows characteristic mineral characters derived from the limestone soils in which the vines thrive. The name “Le Blanc de La Rouge” signifies the fact that the grapes for this white wine are sourced from the La Rouge vineyard (named after the red marl found there). This wine shows how Chardonnay expresses itself differently at this higher altitude than nearby Burgundy. We have been lucky enough to source some of both the 2012 vintage and the 2015 vintage in this shipment. susceptible to disease. However the INAO which officially controls French appellation law does not recognise its existence. There are some oxidative notes in this wine which makes it very appealing to those of us who crave this experience. It is a big, fruity wine but with a razor-sharp streak of acidity offsetting the sweetness of the fruit. As is the case with many of the Bornard wines, the finish is incredibly long. 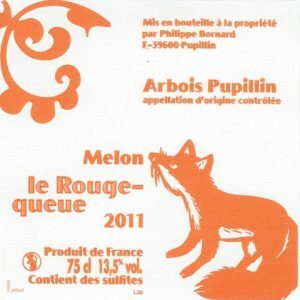 This Melon-Queue-Rouge (a variety related to Chardonnay) is fermented in fiberglass and then aged in old Burgundy barrels and demi-muids. The wine is minty and green apple-y with the characteristic generosity we associate with Bornard’s wines and a riveting streak of acidity that carries through to the finish. This lovely wine is made from 100% Savagnin which is a white grape that is native to the Jura region. It is named after the lieu-dit or plot of land where the Savagnin is grown. As with many wines from the Jura this wine has been made with a slight oxidative edge which gives it a beautiful, nutty, savoury, umami quality that makes for compelling drinking. You will get notes of grapefruit. almonds and hazelnuts and even salt before you notice the long, long finish. This is an incredibly exciting wine that is unlike any produced in this country. You have to try it to see what we are raving about. Note that the term ouillé refers to the technique of topping up barrels as the wine evaporates to ensure that minimal oxygen gets in contact with the wine. an intriguing and beautiful wine that will appeal to lovers of the Jura experience. It’s more affordable than Vin Jaune but, like it, is a wonderful match with nutty cheeses such as Comté, which comes from the same region. Les Gaudrettes was a stand-out at our tasting in Philippe’s cellar. It is a fresh-tasting Chardonnay of some complexity and with a beautiful mouth-feel. It exhibits the same characteristics as his other wines on the finish – long and lingering. The different varieties of marl that are found in the Les Gaudrettes vineyard provide a complex minerality to wines made from grapes grown in this location. is a very pretty smelling wine. On the palate the wine is bright and energetic with a terrific entry on the palate awash with vibrant citrus, apple and pear fruits. The soft spice inflow starts on the mid-palate with hints of minerals, white flowers and grilled nuts. This one sees the juice remain in contact with the skins for three weeks (which we believe is about the right amount of time for a maceration or orange wine – less time and the phenolics do not develop sufficiently and too long and they become too aggressive). This is a delightful wine which goes with just about any foods you care to pair with it – even highly spiced Asian foods sees this wine standing proudly beside them. This wine (formerly called Vin de Pigaille by Philippe) is made in the Vin de Paille style (the authorities thought the name was too similar) and is aged for years before bottling. This wine is a blend of Ploussard, Savagnin and Chardonnay (it is permitted in Arbois Pupillin to add red grapes to white wines provided they don’t exceed 20% of the mix). The technique sees grapes being picked and then left to dry out on straw mats to increase the concentration. Philippe and Tony place fifteen bunches in each tray which are all lined with straw. The bunches do not touch each other. Vin de Paille designation for the wine to be at least 14.5% alcohol, whereas Philippe prefers a lighter, less alcoholic style with this vintage being only 11.5%. The fascinating Ivresse de Noe (named after the biblical story of the drunkeness of Noah) is a November harvest Savagnin. Because Savagnin has a hard skin the grapes can withstand the drying process as they wither on the vine and concentrate the flavour inside the grape. The bunches are then hand-picked and pressed then moved to 400 litre tonneau to mature for two years. The barrels are kept topped up during that time. A little residual sugar linked to high acidity gives this non-oxidative Savagnin an unusual flavour and texture; it is a beautiful, vinous wine with a very long finish. It is often drunk in the Jura as an aperitif but can also be matched with a wide range of foods. This is the magical wine that stole my heart a year ago when I visited the cellar of Philippe Bornard. The Savagnin grapes that make this wine are harvested in November and some residual sugar is left in the wine after fermentation, resulting in a lightly sweet yet concentrated Savagnin that offers aromas of honey, quince, and orchard fruit. This wine has never been seen in the US before and, frankly, if I had the luxury of a Christmas stocking this year, this is the wine I would want to find in it. the geographical area designated for Champagne. This wine is full of stone-fruit aromas and has an appealing minerality and savouriness on the palate. The baked apple aromas and dry finish of this delicious and affordable alternative to Champagne make it a perfect aperitif or a wine to drink right through a meal. We have been hanging out for the re-emergence of one of our favourite pet nats – Tant Mieux. This gorgeous, pink sparkling wine made in the Petillant Naturel style is made from the Ploussard grape. The wine completes its fermentation in the bottle and no sugar is added. Nor is it disgorged so you will find some residual yeast remaining in the bottle. It is very low in alcohol at around 9% and has an appealing residual sweetness. There is not much of it made and we have only a small allocation. However, it remains one of our all time favourite wines as it is just so versatile. You can drink it in the afternoon in the sun, it works well with snacks as the sun is going down and after a solid night of enjoyment it is a perfect drink to put a full stop to the night! The Bornard En Go-guette is a lovely white sparkling wine made in the Petillant Naturel style is made from the Chardonnay grape. The wine completes its fermentation in the bottle and no sugar is added. Nor is it disgorged so you will find some residual yeast remaining in the bottle. It is very low in alcohol at around 10%. This is a beautifully made wine that works perfectly as an aperitif and also as a matching to a range of foods. Philippe is a master of the petillent naturel style and any of his wines of this type are absolute treasures. 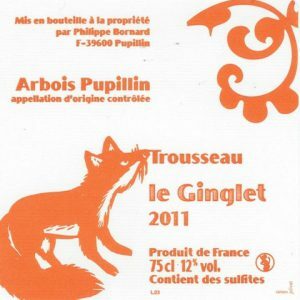 The Troussipet is a pet nat made from the Trousseau grape variety and is a new cuvee for the Philippe Bornard. It is also a white pet nat whereas Trousseau is a red grape variety. Philippe achieves this by directly pressing the grapes so that the juice is not in contact with the skins from where the colour is derived. 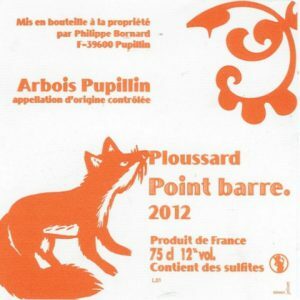 The result is a lively, delicious and thoroughly smashable pet nat that is a delight to drink. “Things are going well” when you are drinking a bottle of the Bornard Ca Va Bien which is a lovely white sparkling wine made in the Petillant Naturel style made from the Savagnin grape. The wine completes its fermentation in the bottle and no sugar is added. Nor is it disgorged so you will find some residual yeast remaining in the bottle. It is very low in alcohol at around 10%. Philippe is a master of pet nats even though he has not produced any for a few years due to the very low yields from his harvests. However, it is wonderful to see this wine back in Australia. to sport the appellation “Macvin du Jura” on the label. The essential point of this wine however is that it is a combination of grape juice and special alcohol. The grape juice never ferments. The process starts by pressing the very ripe Chardonnay grapes to create grape juice. This juice is then heated in a copper pot over a small fire to evaporate some of the water in the juice and to concentrate the sugars in a similar way to the vin cuit in Provence. A marc–style alcohol made in the Bornard cellars from the grape must and matured for at least 18 months and sometimes up to ten years is added to the grape juice. In addition another alcohol called the “fine” is made from the lees and some of this is also added. The exact proportions of marc to fine varies according to the harvest but it is usually around two thirds grape juice to one third alcohol. The wine is then matured is barrels for at least seven years! The result is a gorgeous, sweet wine that can be drunk as an aperitif in the morning or with sweet dishes during a meal. Macvin has been produced in this area since the 14th century even though the appellation was only proclaimed in 1991. The name is a play on words as usual in France. (Jo) Liqueur can be broken down to Joli Queur which sounds like Joli Coeur which is a “happy heart” that you get when you drink this wine.